that my son is daytime trained, but truthfully, it depends on the situation. Read for more details. Obstacle #1: He has to pee while we're in the car and there isn't anywhere to stop. There have been quite a few times that we've been driving and he's said that he had to "pee-pee". Unfortunately we frequently travel a highway near our home with nowhere to stop for a few miles! He doesn't understand the concept of "wait" when it comes to potty training. So what was I supposed to do? We ended up investing in a travel potty set. I keep it in the back of my SUV, ready to go. All we have to do is pull over and we have an instant potty! Obstacle #2: He's afraid of some public toilets. Why in the world do the flushes on some public toilets have to be so loud? My toddler is afraid of them and associates all public toilets with this sound. He is scared to use them. In a store, he may say he needs to potty, but as soon as we walk into a public bathroom he changes his mind about going. I've started using our travel potty as much as possible to avoid this. Whenever we get to a store, I try to get him to use our travel potty before going in the store. Of course, there are times that we are in the store and he needs to go. I do my best to get him to use the public bathrooms in these instances. Obstacle #3: He doesn't tell caregivers he needs to go. This is the biggest obstacle we're dealing with right now and I need advice! My toddler is home with me all day everyday. We rarely have babysitters. Each week he goes to the church nursery for two services on Sundays and one service on Wednesday night. Each service is about an hour and a half long. I take him to the potty before each service, but he always seems to wet during the services. He won't tell the nursery volunteers he needs to use the potty and when they ask him, he says he doesn't need to go. I think it's a combination of being to busy playing to stop, but also me not being there. He's not even really great telling my husband he needs to go, but he's rarely alone with my husband, so it's hard to tell. Honestly, this kid is always with me! What do I do? Do I put him diapers for church? Trainers? He's leaking out of the trainers onto his clothes because they don't hold as much. Part of me thinks maybe he'll just be potty trained when with me and otherwise not (for now). He starts preschool in September. He'll be there two mornings a week and I don't know what to do! Suggestions? Obstacle #4: He pees on the floor out of anger. When my toddler is mad and throwing a fit, he pees. I think he does it because he's not getting his way and he knows he'll get my attention if he pees. I always make him clean up any accidents he has, but this is a tough one! Will he outgrow it? Do I punish him? Do I ignore it? What do I do? 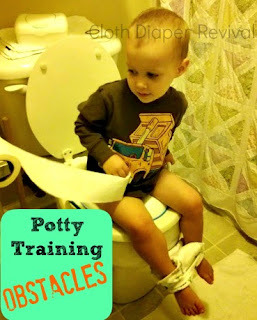 What obstacles did you run into while potty training? We haven't even tackled nighttime training. Can you help with any of the problems we're having? I can help with the autoflush. carry a stack of post it notes with you and put it over the sensor. then shoo him out and take it off and move away and it will flush. or just say, cover your ears it will be loud and move on... either way. they drop the 'fear' after a while.